Music, lighting, television, climate; all play essential roles in our everyday lifestyle and influence our home’s décor. Whether enjoying some lively music poolside, gathering around the TV for your family movie night or listening to smooth jazz while entertaining friends for a dinner party, our integrated audio, video, lighting and climate controls add ambience, comfort and convenience. Having a robust home entertainment system however, once meant having a dedicated media room with floor standing speakers, a massive subwoofer and tons of gear to house in an entertainment unit. That has changed. Today’s systems are sleek, designer-friendly solutions that blend, or disappear, into the room’s décor! Our role as technology systems integrator has transitioned too, as technologies have become artfully integrated elements within our homes. We now work alongside architects and interior design professionals to inconspicuously weave speakers, lighting, window treatments, thermostats and entertainment into homes. And today’s technologies now enhance, not detract from, your home’s design. The choices in speakers are seemingly endless. Ultra slim in-wall and in-ceiling speakers allow installations in spaces previously not possible due to space limits. Combined with weather-resistant features, these make a terrific solution for marine applications as well. When presented with uneven ceilings, James Loudspeakers’ PD Pendants are a perfect solution. Whether indoor or outdoor, these pendant fixtures mimic lighting fixtures and allow for evenly placed audio despite vaulted ceilings and decorative beams. To accommodate color schemes, they come in an array of designer colors and custom premium finishes. A subwoofer requires some space, so audio engineers had to think outside the box or, in this case, behind the walls, under the ground, up in the ceiling…wherever they could place the heart of the audio’s sound. Where that sound entered the space however, had to be much more discreet so they developed ingenious ways of mimicking everyday design elements like kick plates, floor grates, ceiling vents and more. 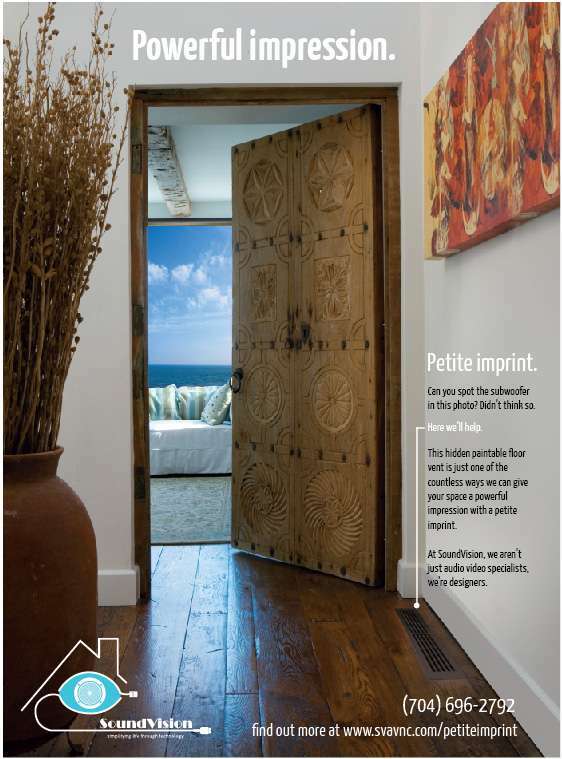 These features can be custom-painted to blend elegantly into the room, virtually undetectable. Today’s soundbars are equally as clever and elegant. They make be custom-built to install flush with eh display or concealed behind a veil of acoustic mesh within a framed mount or even behind a scrolling piece of art! Now, if you’re an audiophile that still demands your floorstanding speakers, heart-pounding in-room subwoofer, vinyl-spinning turntable and all the blinky lights of hi-end gear stored at arm’s reach in your media room, we’re ok with that too. But if you’d like your audio to be heard and not seen, we’ve got the designer-friendly solutions and engineering expertise to make that happen.